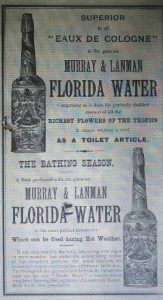 The pleasure of bathing is greatly increased by mixing in the tub half or even a quarter of a bottle of Murray & Lanman’s Florida Water. Instantly the whole atmosphere of the bath-room is as fragrant as a blooming flower garden, the mind becomes buoyant, and the body emerges refreshed and strengthened. delightful and healthful in the sick room, relieves weakness, fatigue, prostration, nervousness and headache. Some say that it has “magical” properties as well and it’s commonly used in Hoodoo, Voodoo, Santeria and Wicca practices for ritual offerings and purification among other things. The article went on to touch on the start of the business. The earliest NYC directory I could find, Longworth’s New York Register and City Directory, published July 4, 1813, listed Robert J. Murray as a druggist located at 335 Pearl Street in lower Manhattan. The same directory also listed his brother, Lindley Murray, as a druggist at 313 Pearl Street. By 1826, and possibly earlier, they were listed together as Robert & Lindley Murray, druggists, located at 263 Pearl Street, corner of Fulton. 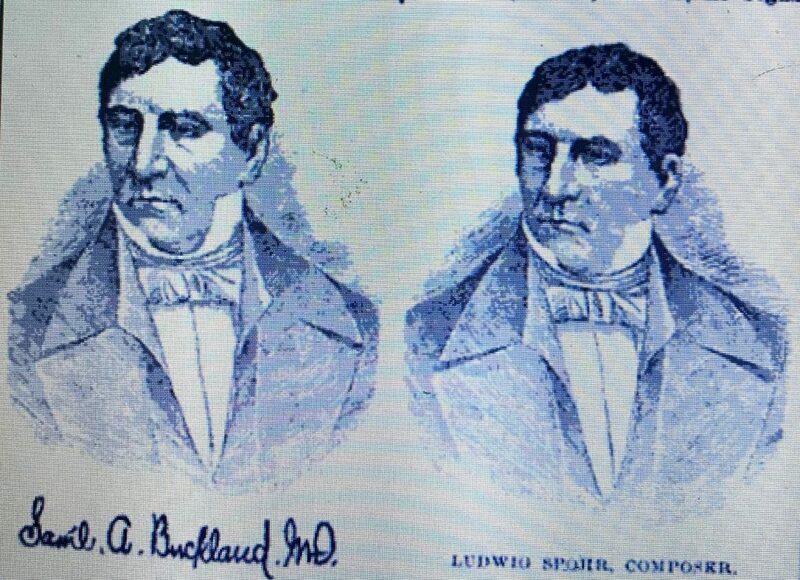 In 1835, it was Lindley Murray along with David Trumball Lanman, who established the partnership of Murray & Lanman. The business was first listed in the 1835 NYC Directory as druggists at 69 Water Street. 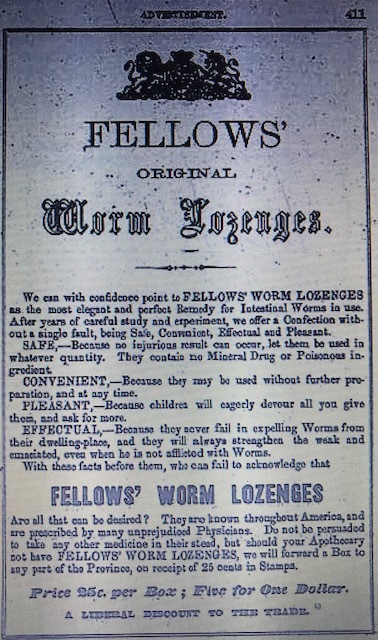 Lindley Murray was also listed individually as a druggist at the same address. In the same directory Robert Murray was no longer listed, either individually or associated with the business. Murray & Lanman was listed at 69 Water up through 1847. Then, in May of 1848, several legal notices printed in the Buffalo Courier named David T Lanman as the “surviving partner” of Murray & Lanaman, so Lindley Murray apparently passed away sometime in 1847 or early 1848. 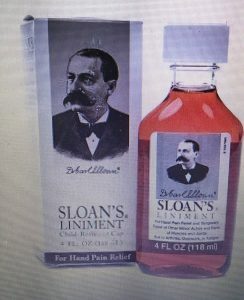 Lanman remained listed individually as a druggist at 69 Water and apparently operated as a sole proprietor until 1853 when he formed a partnership with George Kemp called David T. Lanham & Co. The copartnership notice establishing the business was printed in the January 3, 1853 edition of the New York Times. 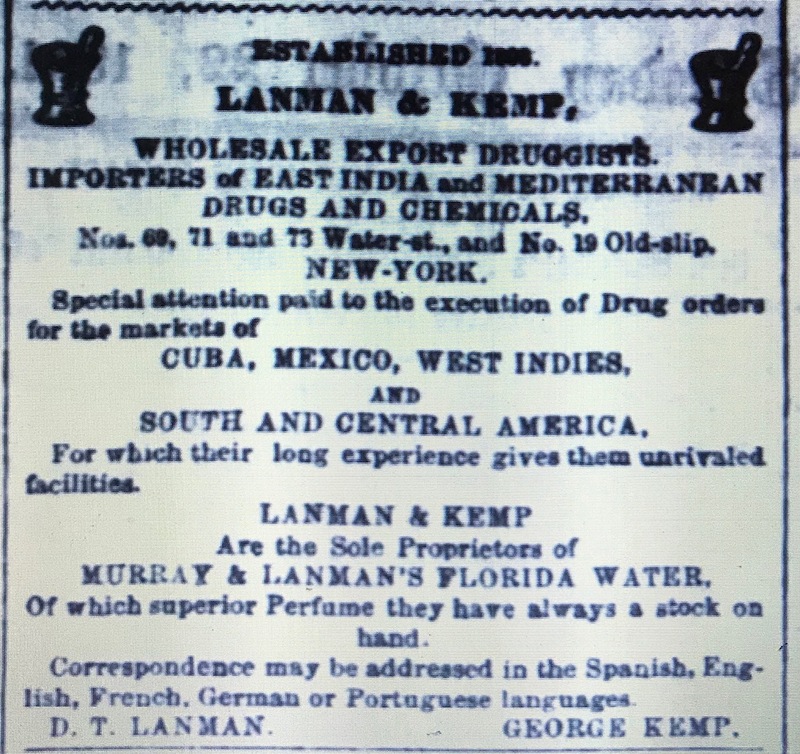 Five years later, another copartnership notice, this one printed in the January 1, 1858 edition of the New York Times, indicated that the name of the partnership was changed to D. T. Lanman & Kemp. 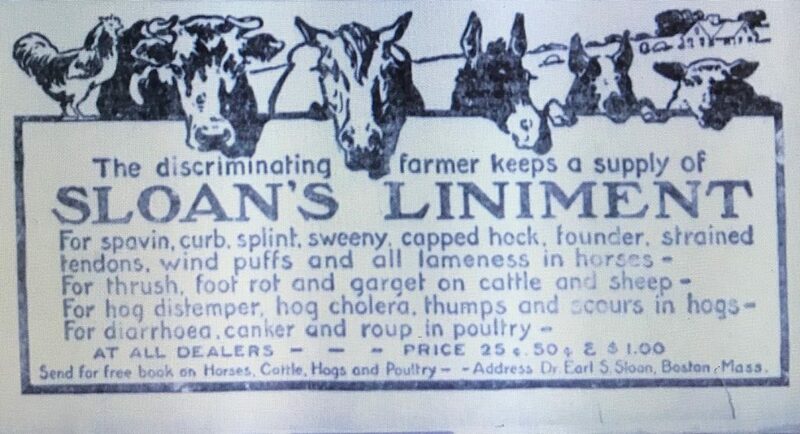 It appears that by the early 1860’s, Lanman was no longer associated with the business. The 1862 NYC Directory no longer listed D.T. 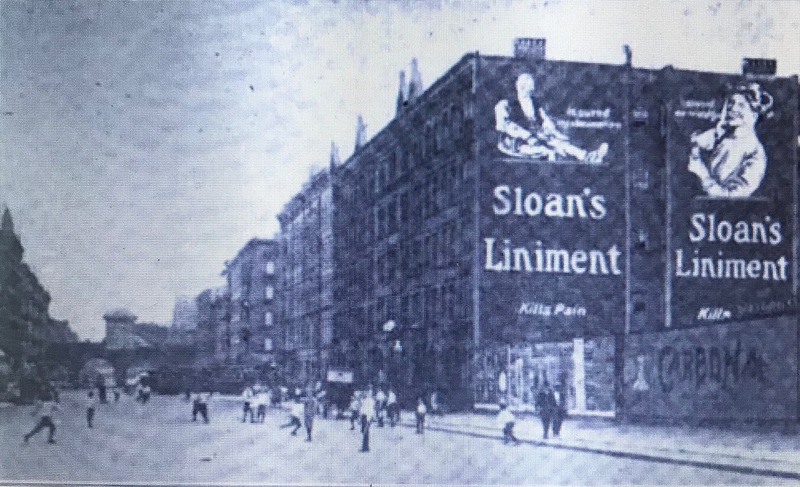 Lanman individually at the company’s Water Street address, and by 1865 the company listing in the NYC Copartnership and Corporation Directory included the phrase “George Kemp only” as proprietor. Lanman & Kemp remained listed at 69 Water Street until 1871 when they moved to 68-70 William Street. 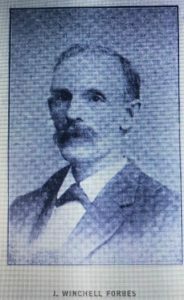 It was around this time that George’s brother, Edward, joined him in the management of the business and he continued to run the business after George Kemp’s death in 1893. According to Edward’s January 2, 1902 obituary he facilitated the construction of their long time headquarters at 135 Water Street. In 1870 he became associated with his late brother George in the firm of Lanman & Kemp, his knowledge of commercial affairs and accurate judgement assisting greatly in making the business highly successful. It was he who built the fine building at No. 135 Water Street, in which the firm’s offices are now located. The company was first listed at this location in the 1900 directory and they remained there through the mid to late 1950’s when they moved to New Jersey. The 1957 NYC telephone book listed their general offices at 15 Grand Avenue, Palisades Park N.J., although it still included their 135 Water Street address as well. By 1959, the Water Street address was no longer listed. They were first listed as Lanman & Kemp- Barclay & Co. in 1933. Today the company is located on Woodland Avenue in Westwood N.J. 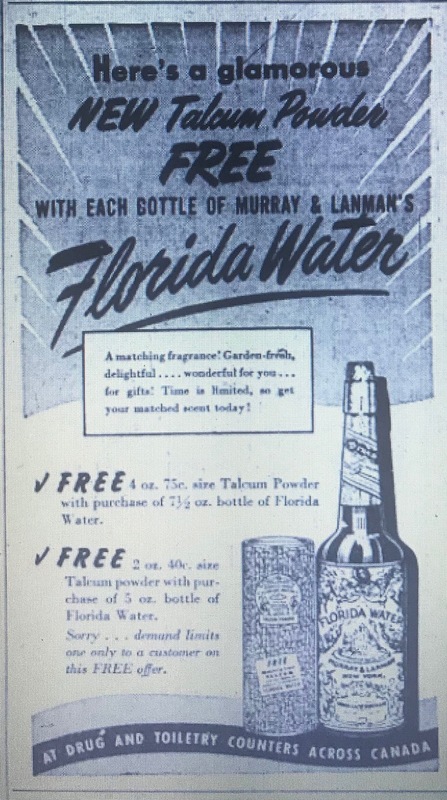 Despite the many company name changes over the years, their florida water was always sold under the Murray & Lanman name and in fact, it’s still sold under that name today. 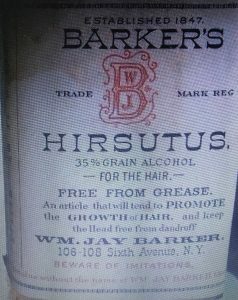 According to Lanman & Kemp-Barclay & Co.’s web site, the product was available in the United States as early as 1808. Murray & Lanman Florida Water was introduced into the United States market on February 14, 1808. Immediately it gained popularity and approval from the consumer and became a woldwide, well-known cologne, not only because of it’s delightful fragrance, but also because of the more than twenty uses attributed to it. 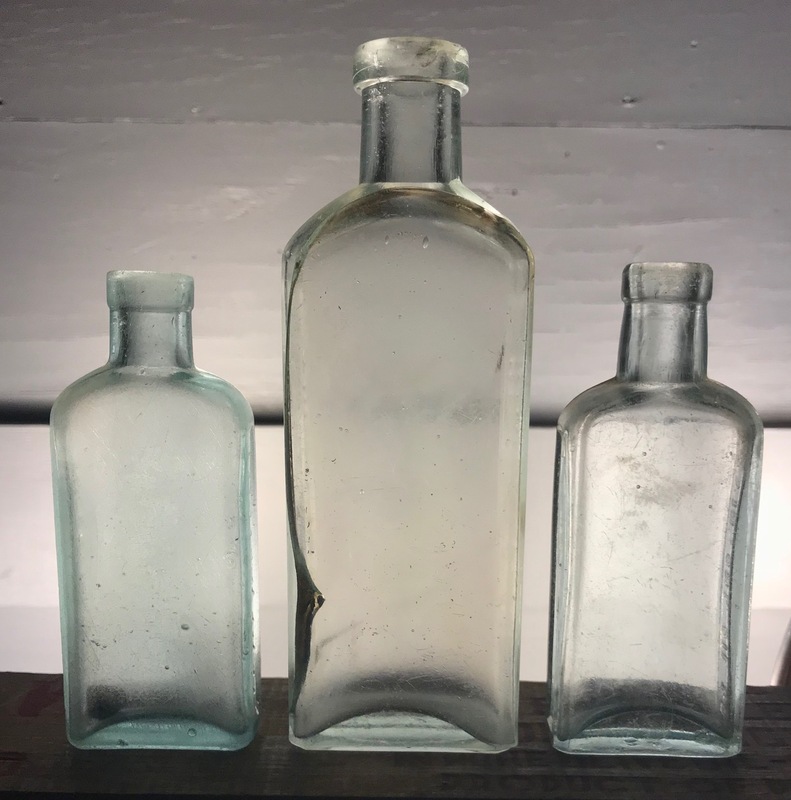 Although the Murray’s may have been selling their florida water locally in the early 1800’s, a series of D. T. Lanman & Kemp advertisements from the late 1850’s indicate that the product wasn’t widely available in the United States until around that time. 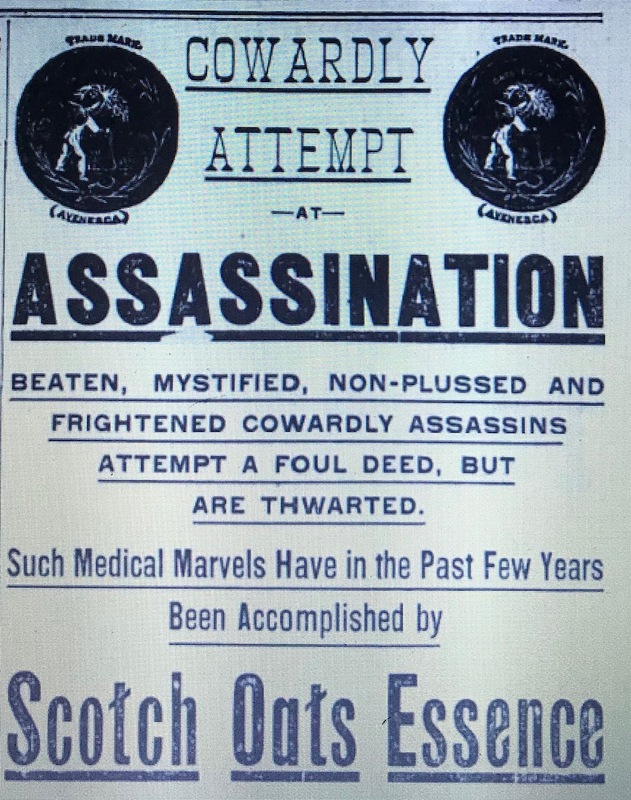 This advertisement which appeared in several Ohio newspapers between April 1857 and July 1858 stated under the heading “What Are Its Antecedents” that it was being sold in the Latin American countries for twenty years before being introduced in the United States. For twenty years it has maintained its ascendency over all other perfumes throughout Cuba, South America and the West Indies. It has been introduced into the United States in response to the earnest demand growing out of its southern reputation. Murray & Lanman’s Florida Water from its great celebrity in the South America and West Indian markets, for which for twenty years it was exclusively manufactured has been extensively imitated in the United States. Now however, the original article has been introduced throughout the Union, and as it bears the distinctive trade-mark of the proprietors, may be readily distinguished by its externals from the simulated preparations. 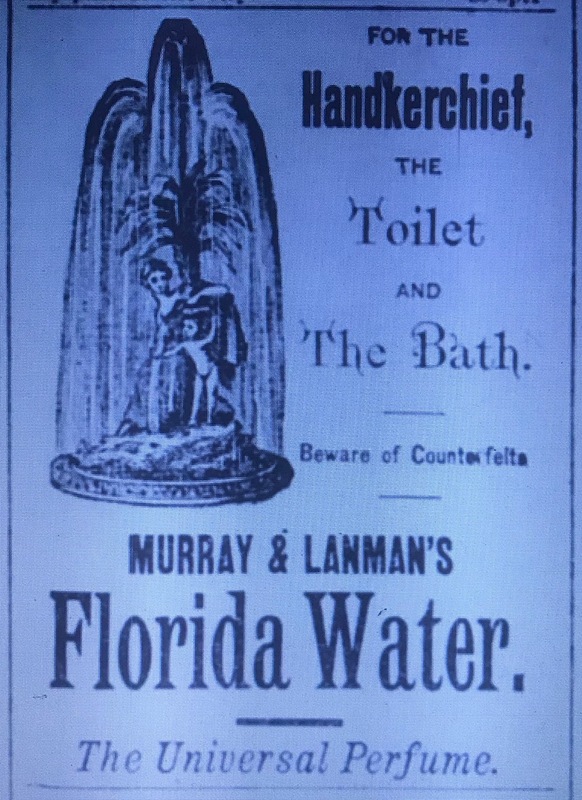 So, if you believe their own advertising, Murray & Lanman’s Florida Water was being exported to the West Indies and South America as early as the mid to late 1830’s, around the time the company was first established in 1835 and introduced in the United States sometime in the mid to late 1850’s. Recognizing the company’s focus on foreign markets this seems to make a lot of sense. What strikes me most about this product and the various companies that produced it over the years is the consistency of the image they have portrayed. 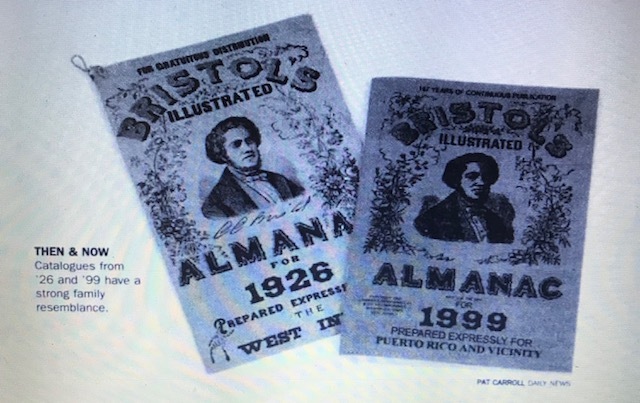 The cover of their almanac hasn’t changed in over 100 years. Likewise, their bottle and its label have changed little, if at all. 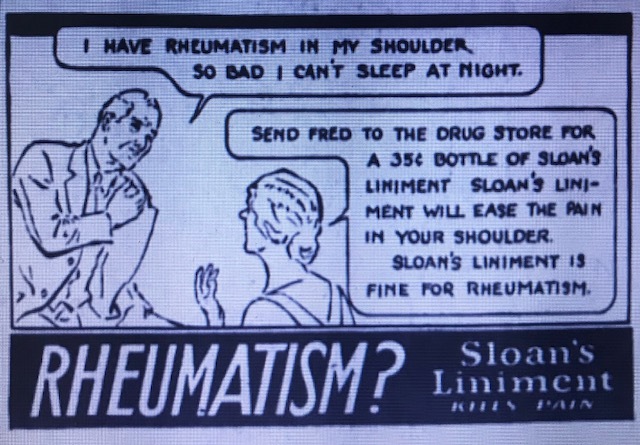 Advertisements from 1887 and 1946 bear this out. 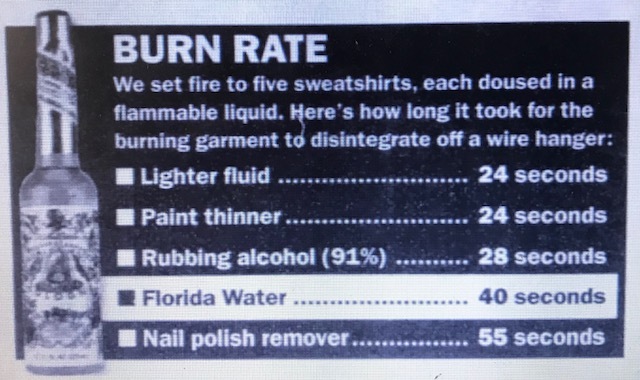 In an indoor, controlled setting, Daily News reporters timed how long it took each product to turn a large cotton sweatshirt into a ball of flames. About 4 ounces of each product was sprinkled on identical sweatshirts suspended on a wire coat hanger and ignited with a candle. The sweatshirt doused in Murray & Lanman Florida Water was engulfed in flames in 10 seconds. At 15 seconds, flames were shooting up 2 feet from the shoulders and by 40 seconds the sweatshirt was completely burned off the hanger. The complete results of the experiment were published in the story. The bottle I found is the typical florida water shape and is mouth blown. It’s embossed “Florida Water/Murray & Lanman/ Druggists/New York.” I’ve seen examples on the internet that also include the 69 Water Street address so it was most likely manufactured at the William Street location or right after the move to 135 Water Street. Sallade & Co. was established by Mary F. Sallade, a widow who arrived in New York City via Philadelphia in the late 1870’s. She was last listed in the 1878 Philadelphia Directory as a widow with the occupation “plaitings,” someone who makes dressmakers trimmings. In fact she held several patents in the late 1800’s related to plaiting machines. 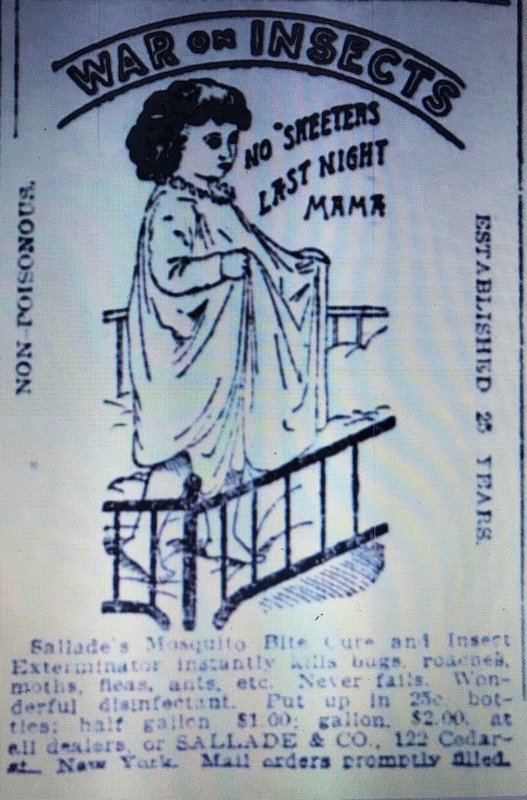 The mother of a small daughter, Sallade’s early marketing strategy played heavily on that theme of motherhood. In the late 1870’s through mid 1880’s, her Manhattan address changed on a regular basis and included 39 Union Square (1880), 878 Broadway (1881), 16 West 23rd (1883), 8 East 18th (1884 to 1889) and finally 53-59 West 24th beginning in 1889. 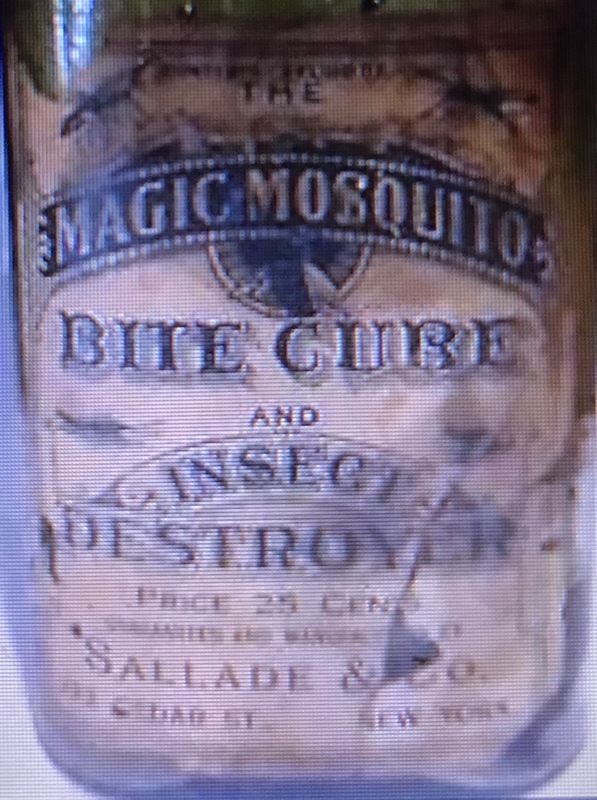 By this time the insecticide was for sale in many of New York’s large department stores; most notably Macy’s, Bloomingdale’s and Lord & Taylor. 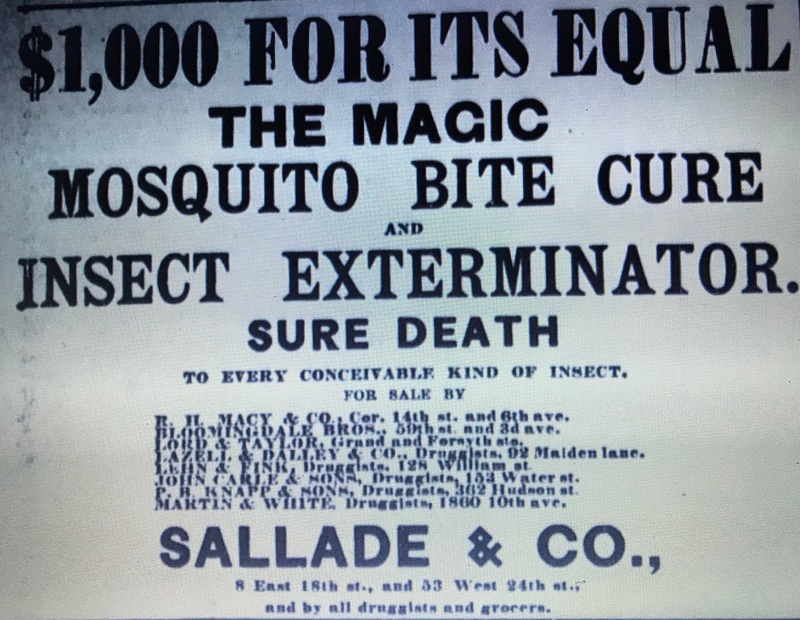 In the mid 1880’s Sallade was also attempting to grow the business outside the New York area as well. 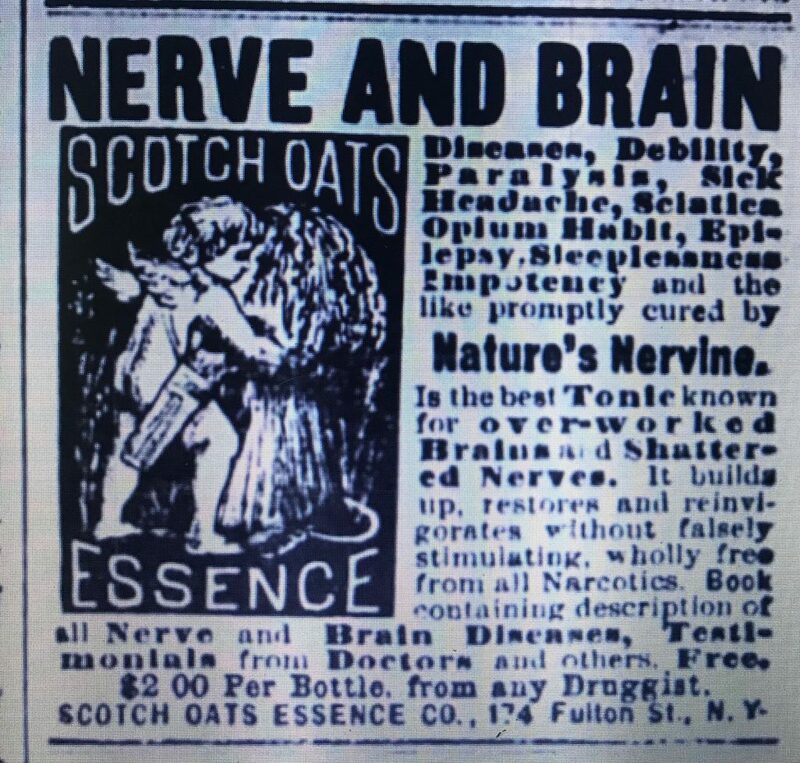 In the fall of 1885, she placed newspaper advertisements in at least 6 states:North Carolina, Alabama, Pennsylvania, Indiana West Virginia and Kansas, as well as Washington D.C. looking for agents to sell her product. 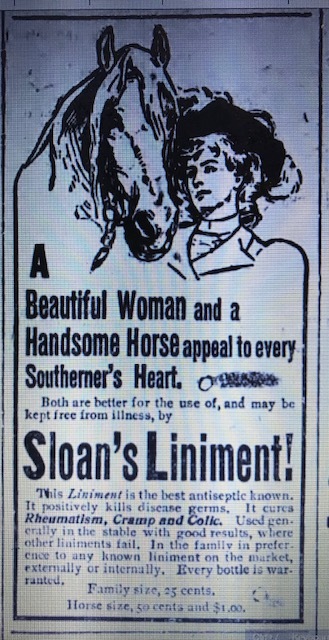 This advertisement from the Hagerstown (Indiana) Exponent was very typical. In the mid-1890’s Sallade transferred ownership of the business to Thomas T. Pountney. Between 1896 and 1922 most NYC Copartnership and Corporation Directories listed the business as “Sallade & Co., T.T. Pountney, only.” Mary Sallade continued to be listed in New York City through 1910 as a plaiter but was no longer associated with Sallade & Co. 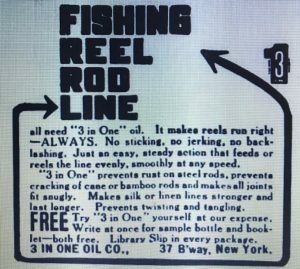 The company remained listed in New York City through the late 1940’s at 121 Leroy and 99 Pine (1920’s -1930’s) and 67 Cortlandt (1940’s). Thomas Pountney died in March of 1937 but it’s not clear how long he remained associated with the business. 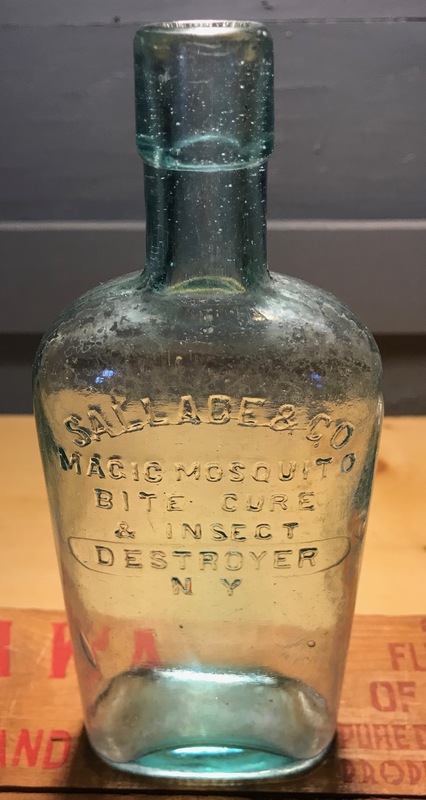 The bottle I found is a mouth blown flask that exhibits the term “Insect Destroyer” as opposed to “Insect Exterminator.” This suggests that it dates no earlier than 1915 to 1917 when the name changed. 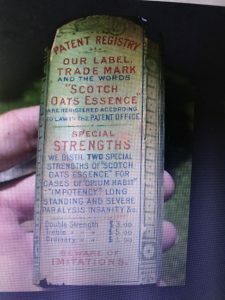 It matches a labeled bottle recently exhibited on e-bay that exhibited the Cedar Street address. Crab Orchard Spring Salts, J.B. Wilder & Co., Louisville, Ky. According to the State of Kentuck’s web site, Kentucky is home to numerous natural mineral springs. 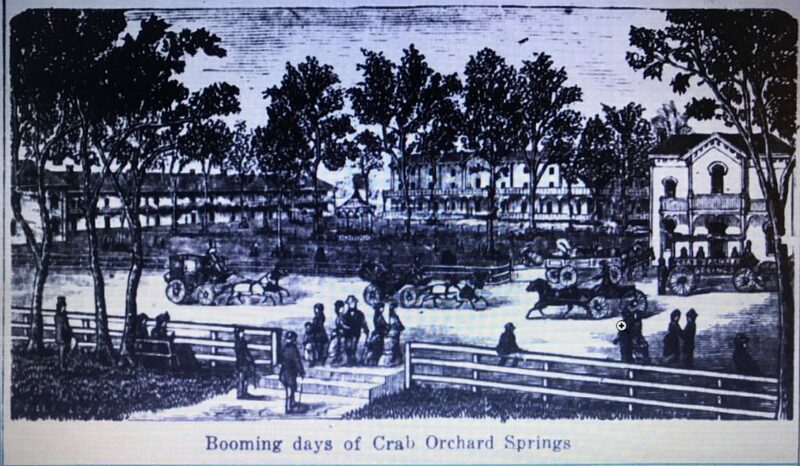 One group of mineral springs was located near the town of Crab Orchard, where a popular resort, sometimes referred to as the “Saratoga of the South” (and sometimes “West”) was established in 1827. The resort operated into the 1930’s and drew people from all over the country. An 1883 notice that announced the seasonal opening provides a little insight into the scope of the resort and its amenities. The buildings have been placed in first-class condition and everything possible will be done to promote the comfort and add to the enjoyment of the visitors. The hotel and cottages with all modern improvements, gas, telegraph office, telephone connections, extensive promenades, ample amusements, ball-room, music, billiard-room and bowling alleys, with excellent fishing and hunting convenient. The waters for medicinal qualities, excellence and variety are the best the world affords – the Epsom, White Sulphur and Chalybeate being the finest and purest in the United States, the sulphur greatly excelling any found in Virginia. 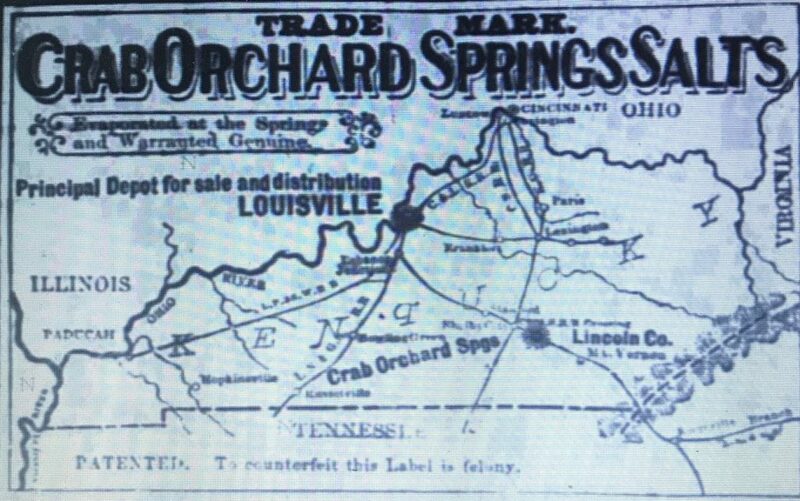 The Crab Orchard Springs Salts Manufacturing Company, having secured the control of all the territory in which the genuine salts are produced, in order to protect the public against the spurious article; are now putting up the salts in one pound and half-pound bottles, with the name of the company thereon in raised letters, and labeled with a miniature map of the State of Kentucky. 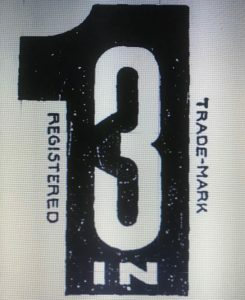 A copy of their trademark label/map was included in the advertisement. The advertisement goes on to provide a description of the salts and their supposedly curative properties. These salts are obtained from the waters of the mineral wells near Crab Orchard, a small town in Lincoln County, Ky, whence the name is derived. As long ago as 1825, a farmer in that vicinity observed a globular substance remaining after some of the water had been evaporated by the sun. He immediately began to experiment, and by bottling obtained a small quantity of the salts. 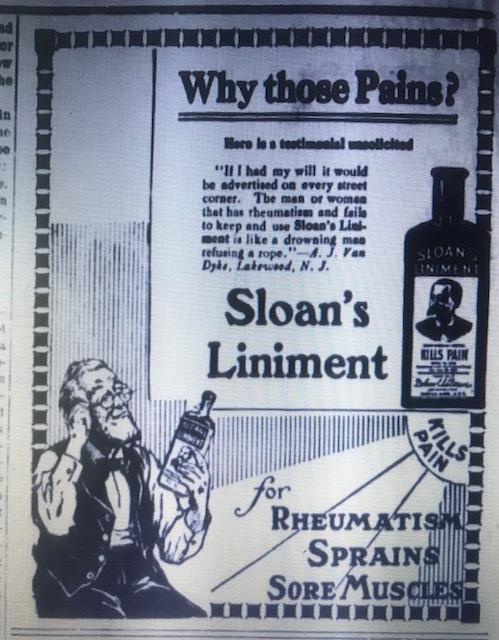 The analysis of this by a competent physician at once showed that it contained Sulphate of Magnesia and it was at first pronounced epsom salts. Soon, however, it became apparent that it contained other constituents besides the Sulphate of Magnesia. 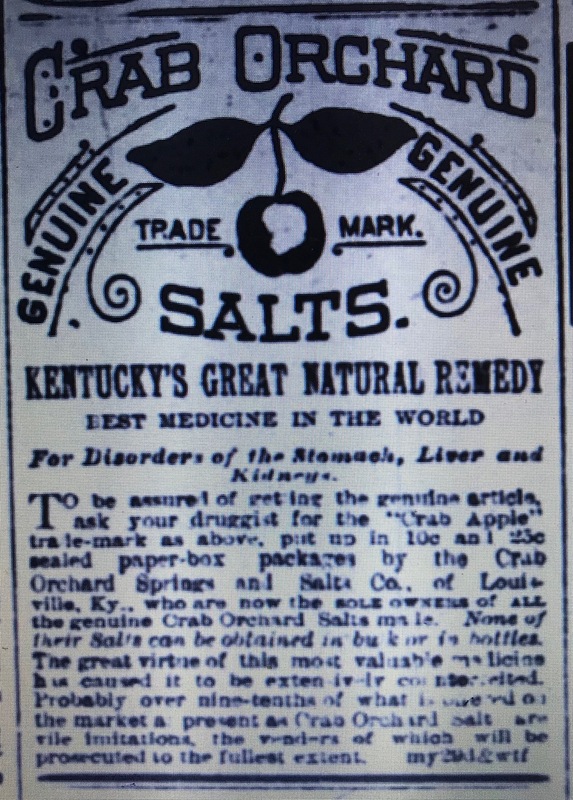 possessing medicinal properties as powerful and more salubrious, and it acquired the appellation “Crab Orchard” as contradistinguished from Epsom Salts. …The salts are made by boiling the water impregnated with it in large iron kettles; when boiled down to sufficient consistency the contents of the kettles are stirred gently until they granulate. Nine gallons of water yield one pound of salt. …They are pronounced to have a specific action on the liver, joined with good tonic properties, being the only salts known in the world with these valuable qualities. 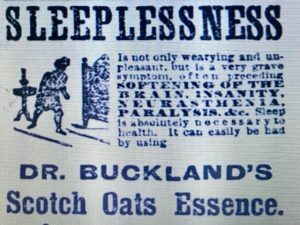 They are specially recommended for patients suffering from Dyspepsia, Biliousness and Piles, and for persons who indulge in strong alcoholic drinks. The dose is from half an ounce to an ounce, dissolved in water. They act with greater certainty and more advantageously when given in drachm doses, at short intervals, until half an ounce is taken. The next year, an advertisement/notice dated February 19, 1875 appeared in at least two issues of the Courier-Journal that stated that the Crab Orchard Springs Manufacturing Company had appointed J.B. Wilder & Co. as the sole and general agent for the sale of all Crab Orchard Springs Salts. The notice was endorsed by H.N. 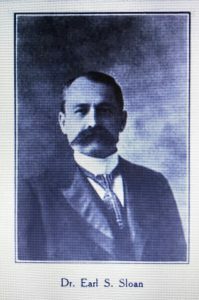 Haldeman, President of the Crab Orchard Springs Manufacturing Company. 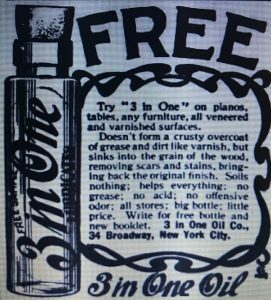 According to their advertising, Wilder & Co. was established on October 15, 1838 so by the time they partnered with the Crab Orchard Springs Manufacturing Company they had been in business for almost 40 years. 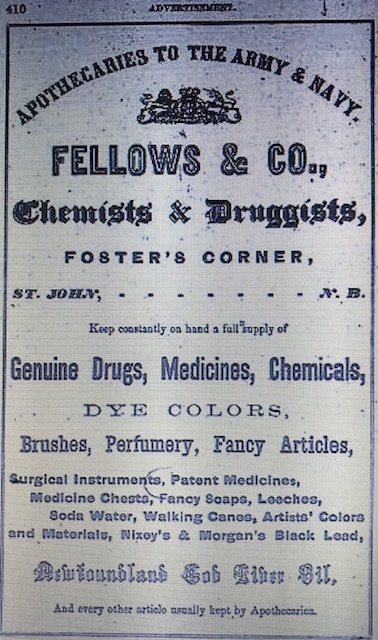 Wholesale druggists, early advertisements from 1839 listed their first location as simply 4th Street in Louisville. Sometime after 1844 they had moved to MainStreet In Louisville where they remained through 1888. During this time they utilized several Main Street addresses: 181 Main (1866 to 1878), 215 Main(1878 to 1882) and 601 -605 W. Main (1882 to 1887). As far as I can tell, at the time, each of these addresses was located on the block between 5th and 6th Streets. 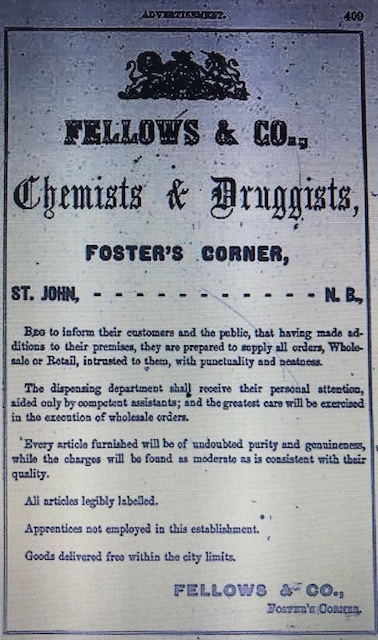 The business was well known in the south serving as a wholesaler for drugs, medicines and a lot more. This advertisement, printed in the March 14, 1878 edition of the Courier-Journal listed a menu of the various items that they carried. 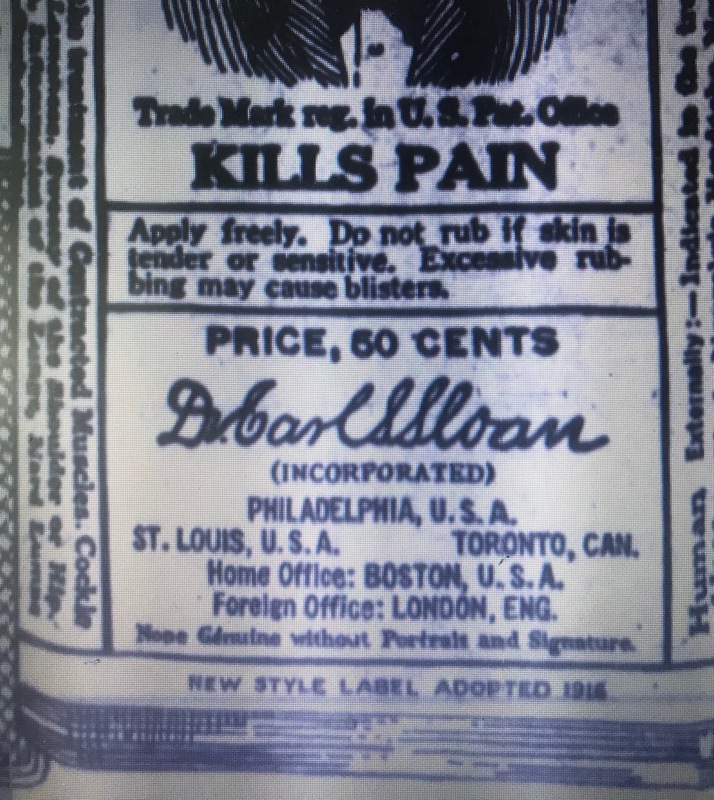 Newspaper advertisements also named them as agents for a wide variety of patent medicines as well including Sand’s Sarsaparilla, Wistar’s Balsam of Wild Cherry and Dr. Abernathy’s Ambrosial Balsam to name a few. 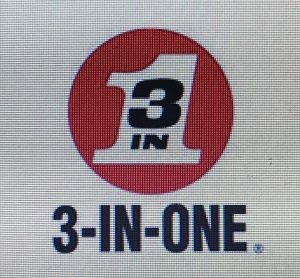 I assume that the company was started by James B Wilder. Both he and J.B. Wilder, who I assume was most likely his son, were listed in the 1850 census records; James as a merchant and J.B. as a 32 year old druggist. The elder Wilder passed away sometime around 1860 and by 1866, J.B. Wilder & Co. listed three partners: J.B. Wilder, his son Graham Wilder and Thomas O’Mara. Around 1876 they began listing a fourth partner, T.A.Courtenay. In 1882 O’Mara retired. The youngest Wilder, Graham, died in 1885 and his father, J.B. died three years later in May of 1888. That left Courtenay as the sole surviving partner and according to this September 1, 1888 notice in the Courier Journal, he promptly put the business up for sale. It appears that J.B. Wilder’s relationship with the Crab Orchard Springs Manufacturing Company that started in 1875, continued until sometime in late 1882 or early 1883. In August of 1882, H.N. Haldeman, purchased the Crab Orchard Springs property. The sale was reported in the August 11, 1882 edition of the Courier-Journal. The Crab Orchard Springs property was sold today by a decree of court for $26,000, and the furniture and fixtures for $3,500; total, $29,500. It was purchased by H.N. Haldeman, representing a Louisville syndicate. The property cost nearly $200,000, and, considering its intrinsic value, is regarded as the lowest sale ever made in the United States. Following the sale, on January 10, 1883 they formed a new corporation called the”Crab Orchard Springs and Salts Company.” H.N. Haldeman was named as a director, along with Bennett H. Young, E.F. Trabue and P.B Muir. According to the incorporation notice printed in several January/February, 1883 editions of the Courier Journal, the new corporation’s business included the manufacturing and vending of the salts. The business of said corporation shall be the operation of a summer resort and hotels in connection therewith near the town of Crab Orchard , in Lincoln County, Ky., manufacturing and vending salts and other products of mineral medicinal waters, with power in connection therewith to accept leases of the right to take and use such waters and lands necessary for the manufacture of such salts and other products of such waters and to do other acts incident to the purposes aforesaid. These developments make it pretty clear that Haldeman and his new corporation were attempting to cut J.B. Wilder & Co. out of the equation. 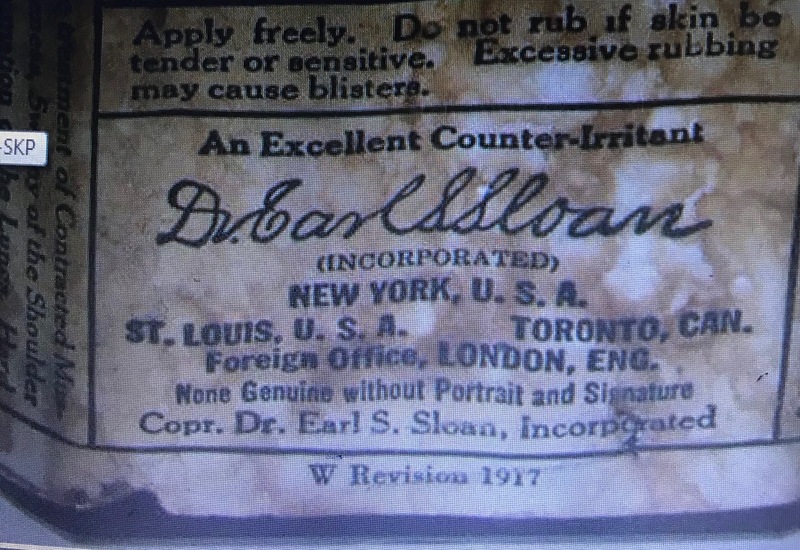 Nonetheless, it appears that J.B Wilder & Co. continued to represent themselves as the product’s agent. This is supported by this Wilder advertisement for the salts that included the old “Kentucky Map” trademark and the 601 Main Street address. Wilder started using this address sometime in late 1882 so, while not definite, it’s highly possible it was produced after the January 1883 incorporation date of the Crab Orchard Springs and Salt Company. An article in the September 13, 1883 edition of the Courier-Journal, reporting on Wilder’s display in the “Great Southern Exposition” being held in Louisville at the time, addressed the issue. To be fair, H. N. Haldeman, was also president of the Courier-Journal so its highly possible that there was some bias built into the above story. 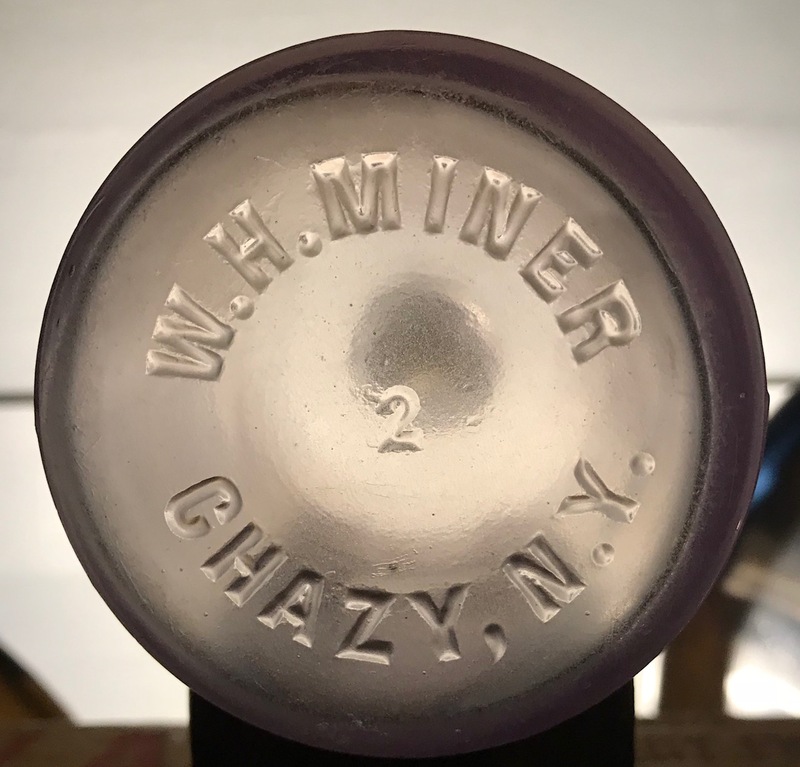 Whether J.B. Wilder & Company continued to sell these salts up through their liquidation in 1888 is unknown. 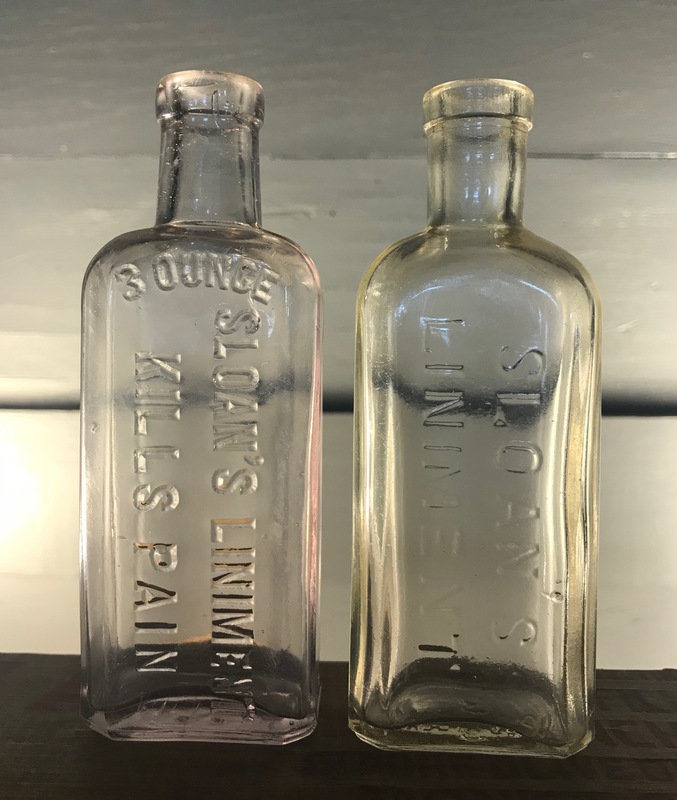 The bottle I found is mouth blown and embossed: “Crab Orchard Springs Salts, J.B. Wilder & Co., Louisville Ky., Sole Agents for the Company.” The bottle is 5-1/2 inches tall and 2-1/4 inches in diameter and is probably their half pound size. It’s shape matches the one in the 1880’s advertisement above. The embossing takes up half of the bottle, leaving the other half for their trade-mark label, which is long gone. James Winchell Forbes developed the formula for Forbes Diastase and founded the Forbes Diastase Company. 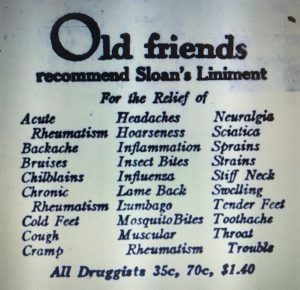 Until the mid-1920’s, it was not available to the general public but only sold to wholesale druggists from whom physicians could procure and prescribe it. 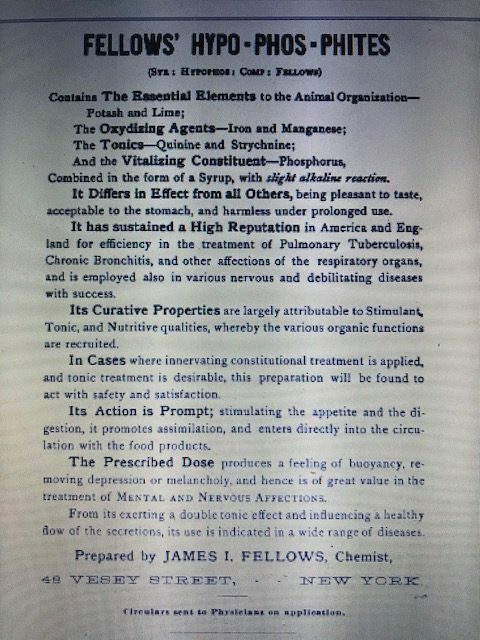 The early story of J Winchell Forbes and Forbes Diastase was printed in the January 1, 1893 issue of the Pharmaceutical Era and portions of it are summarized in the paragraphs below. 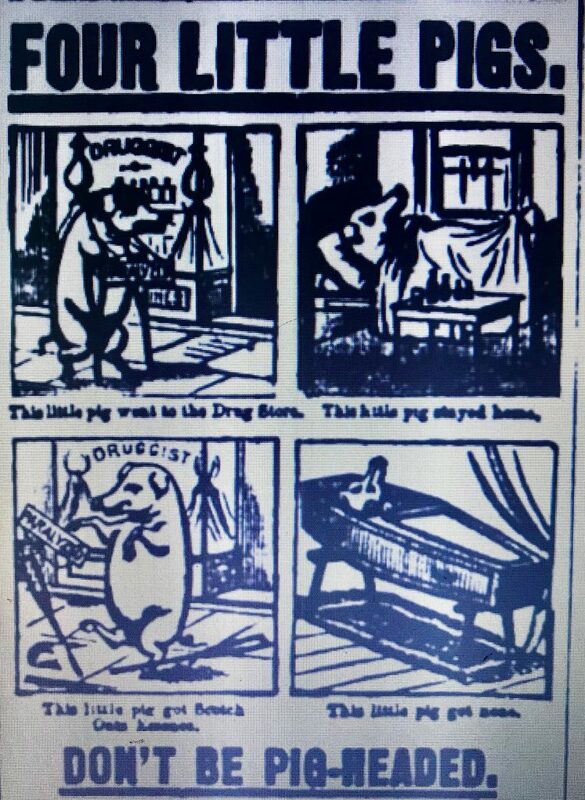 J. Winchell Forbes was born in Troy N.Y., in 1837 and in a peculiar pharmacy atmosphere, his childish playground being the upper stories of the drug store of his granduncle, the late John L. Thompson. He started his pharmacy career in the drug and manufacturing house of Chas. F. Rogers in Lansingburgh, N.Y., but in 1859, lured by the California “gold rush,”he moved to San Francisco. After a short time, he was back in the pharmacy business out west, ultimately becoming a charter member of the California Pharmaceutical Society. After nearly 20 years in California and Nevada he returned east. 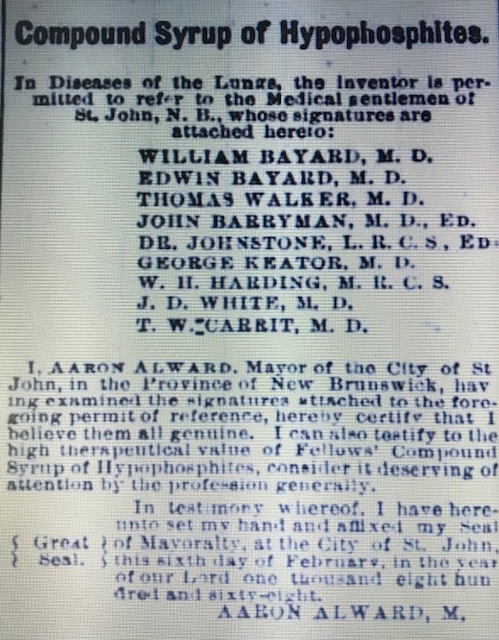 …he came to Cincinnati and at once obtained a position as superintendent of an extensive laboratory in this city. In this position he remained nearly four years when he resigned in order to devote his entire time to analytical work and the study of chemistry and its collateral sciences, biological chemistry receiving the most attention…Reasearches in biology showed the necessity and a long series of experiments resulted in the production of Forbes Diastase during this time. Being without capital and unwilling to enlist that of others in what then was in the embryo stage, Mr. Forbes paid his expenses with his pen. then returned to analytical work and perfecting the details of manufacturing “Liquor Diastase,” as it was then called. In the latter part of 1890, these details being perfected, “The Forbes Diastase Company” was organized and the preparation placed regularly on the market. Mr. Forbes entire time is occupied with his duties as secretary of the company and general superintendent of laboratory details, and figuratively speaking, he has scarcely time to maintain a speaking acquaintance with his family. Cincinnati directories from this era both confirm and supplement this early history and later complete the picture. He was listed individually as a chemist in 1882 and 1883. 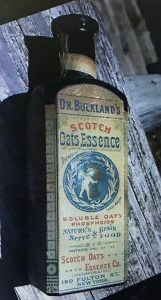 Then, in 1884, he was listed as the superintendent of the Standard Chemical Company, where he was manufacturing and selling the early version of his preparation called “Liquor Diastase,” that was at the time, as the biography states, in its “embryo stage.” This is confirmed by the following advertisement that appeared in an 1884 issue of the “Eclectic Medical Journal,” a publication of the Ohio State Eclectic Medical Association. 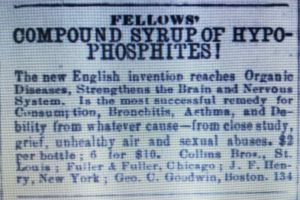 In accordance with the biography, in 1887 he was listed in the Cincinnati Directory as an editor but by the late 1880’s he was back listing himself individually as a chemist. Finally in 1890, the Forbes Diastase Company was listed in the Cincinnati Directory for the first time. R.D. Mussey was named president, Forbes was vice president and Paul Crosley and Wilmot J. Hall were treasurer and secretary respectively. The address was given as 74 Johnston Bldgs. 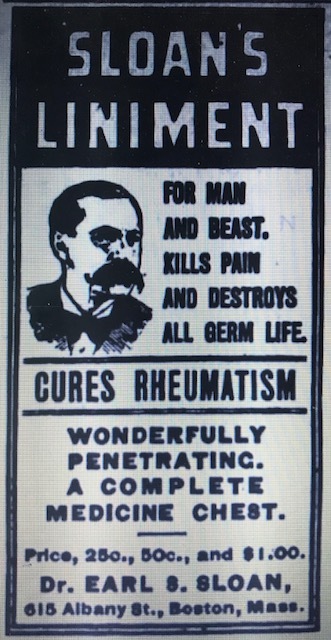 The following advertisement in the Columbus Medical Journal, printed in July of 1890 has to be one of, if not their first ads. 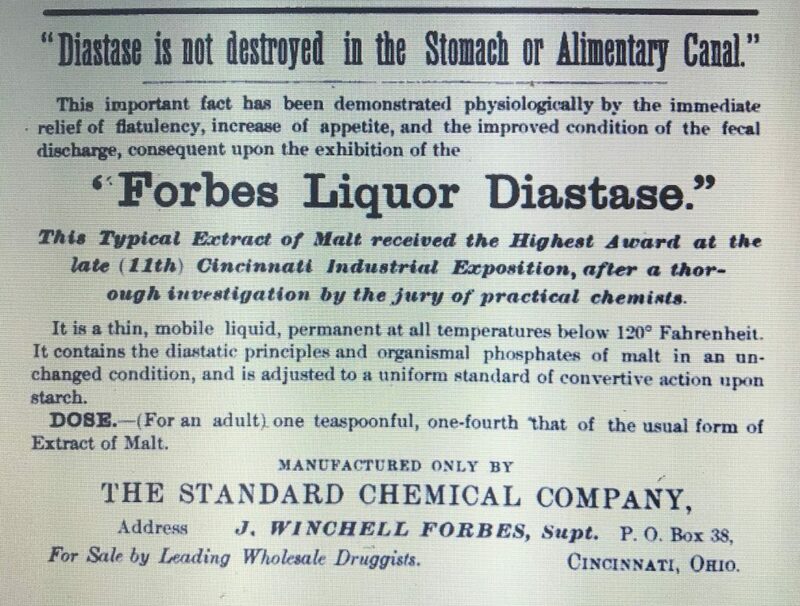 It starts out: “In presenting Forbes Diastase to the Medical Profession, we…” and appears to be completely introductory in nature. The 1891 directory listed two locations: the office at the northwest corner of 4th and Elm and the plant or laboratory at Locust near Elmwood Ave (later 1128 Locust). The business remained listed in Cincinnati until 1898, during which Forbes was listed with different titles from year to year; sometimes vice president, secretary, superintendent, but never president. 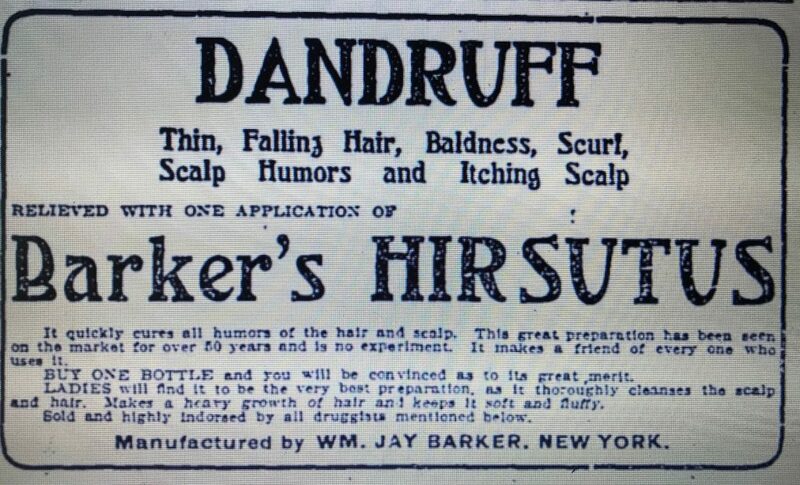 An item in the November 20, 1897 edition of the Cincinnati Enquirer announced that the company had just incorporated. The Forbes Diastase Company of Cincinnati was incorporated today with a capital stock of $50,000, the purpose being to make and sell diastase and other chemicals. Mr. D.H. Buell has broken ground for a new two-story brick building on the rear of the Hovey property, Third Street and close by the union depot. Mr. Buell will occupy his new building for the manufacture of Calabar Grains and Forbes Diastase. In 1902 the company reincorporated and between 1902 and 1913 the Forbes Diastase Company was listed in the Marietta City Directory, with a Union Street location and Buell named as either president or proprietor. 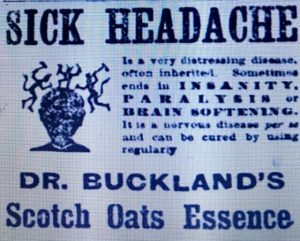 The 1906advertisement below, referencing the Marietta, Ohio location, is from the Memphis Medical Journal. 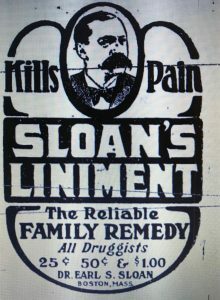 By 1913 it appears that the business was not headed in the right direction They reincorporated again in 1915 reducing capital from $50,000 to $10,000 and subsequently were no longer listed in the Marietta or ERA Druggist Directories. The business apparently remained operational because they were listed sporadically. 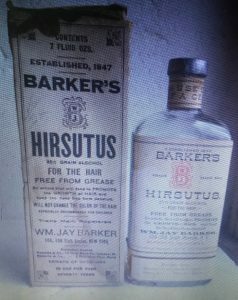 I found them listed as Marietta Ohio manufacturers in the 1919 Modern Hospital Yearbook and the 1922 Druggist Circular. 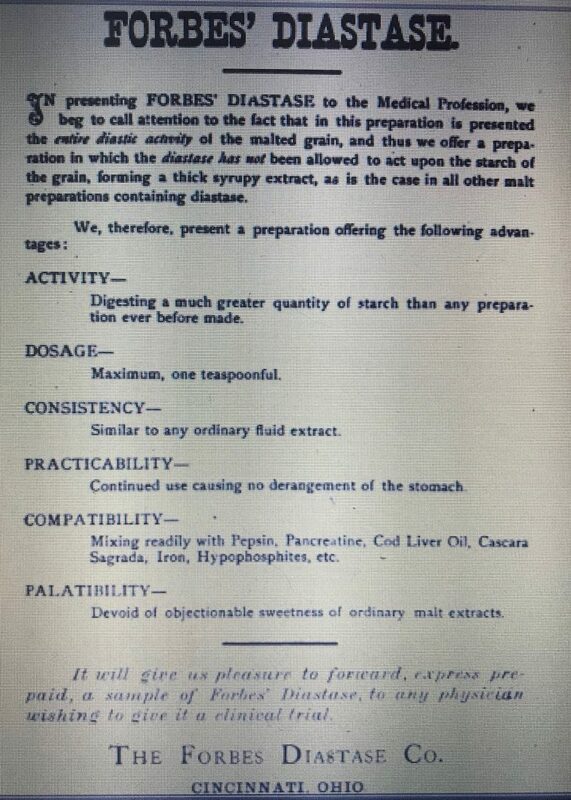 Prepared exactly as it was 40 years ago, Forbes Diastase is again on the market for use in cases where either an impoverished supply of diastase or other digestive disturbances require additional starch-digesting power. 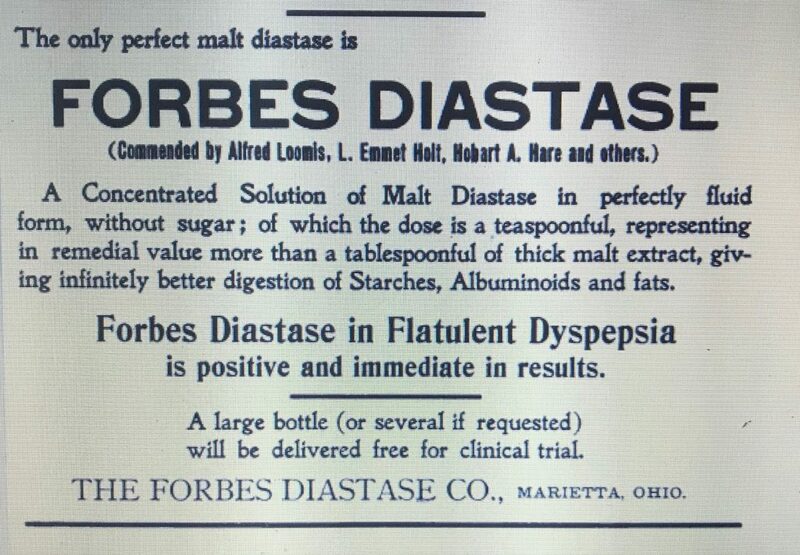 Forbes Diastase is in reality exactly the same marvelous diastase that is manufactured by the human system for digesting fats and starches, the Forbes Diastase can digest 1000 times its own mass of starch in five minutes. Forbes Diastase does not eliminate. It digests. 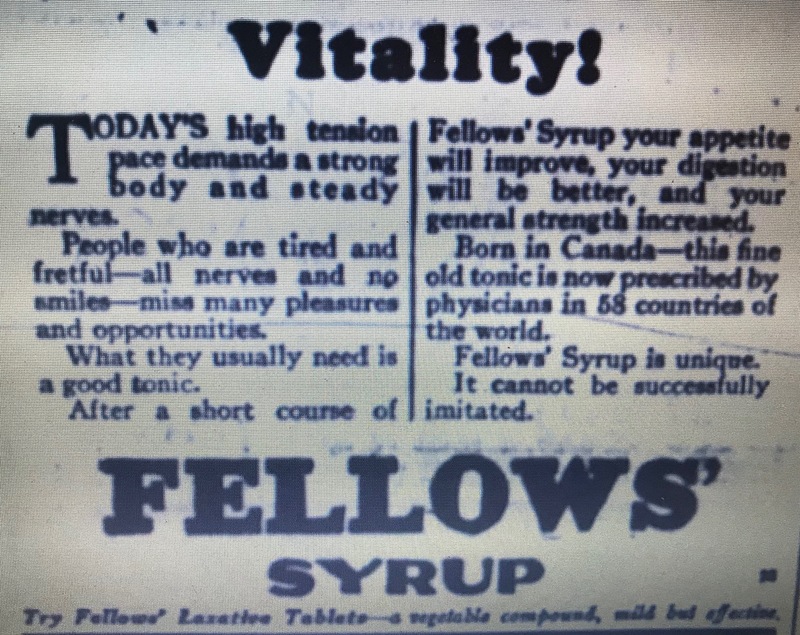 Therefore it is not only good for all people – it is positively wonderful for convalescents and sick folk whose digestive apparatus is below par. Excellent for building up thin, scrawny, under nourished children. Forbes Diastase has been on the market for 40 years by prescription only. Everybody can now buy it – at these druggists: Kelly’s, Spillan’s Central, Trebell-Calkins drug store. 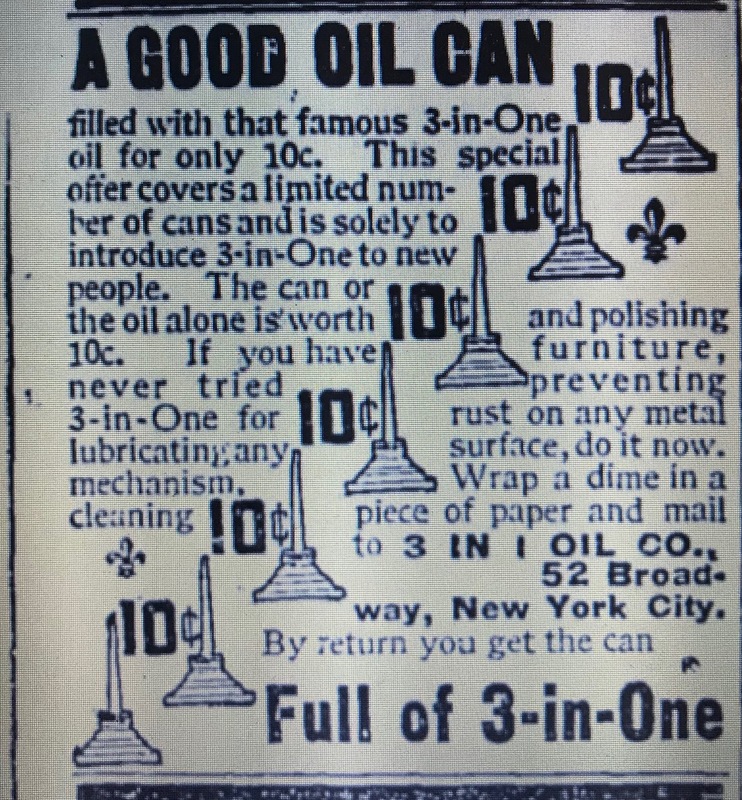 A series of these advertisements appeared over a six month period from December 1925 to May 1926 and only in limited geographic areas; upstate New York and Indiana. 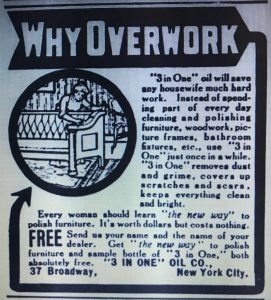 By the end of May the advertisements ceased for good and I have to assume that the business didn’t last much longer. In 1899, when Buell moved the company to Marietta, J. Winchell Forbes remained in Cincinnati and apparently continued to work on improving his diastase. On April 22, 1908 he established a corporation called the Dexigen Company and began manufacturing his improved product which he called Forbes Dexigen. 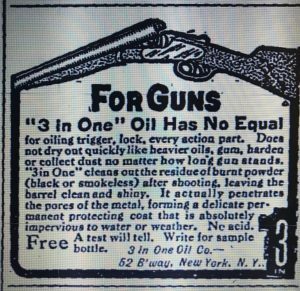 An item in the November, 1908 issue of the Midland Druggist described the new operation. J. Winchell Forbes, originator of Forbes Diastase, and well known to readers of pharmaceutical journals, is the president and general manager of the Dexigen Company, whose new laboratories have recently been installed at 347 E. Third St., Cincinnati. Dexigen, a name coined from dextrin and generator is an improved form of diastase, is a much more powerful starch ferment than the varieties heretofore produced, and has the additional merits of definite strength and good keeping qualities. 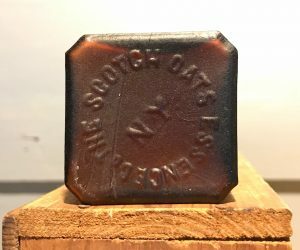 It is the result of more than thirty years of study and experiment on the part of Prof. Forbes, and is believed to represent the enzymes of malt in the highest state of efficiency that has yet been attained. It will be marketed strictly upon ethical lines, and we speak for it the favor of both pharmacist and physician which we believe its merits deserve. The bottle I found is mouth blown with an applied lip. It’s embossed “The Forbes Diastase Company” and the embossing includes the Cincinnati Ohio location. This dates it between 1890 when the business started and 1898 when it moved to Marietta, Ohio.